Affordability is a tough nut to crack. For decades, the production housing industry has operated under a simple premise: Americans value space above all else. If you want to make a house more affordable, you build the same house with lower quality materials and cheaper details. Goodbye four-sides brick, hello one-side brick. Or no-sides brick. It’s a perfectly sensical approach and, for some folks, it works out just fine. They get more house for the money and, because it’s new, it’s likely to last at least as long as they plan to live there. In short, it’s affordable. For now. Disposable dwellings are one, albeit shortsighted, way to meet the need for affordability but today I’m more focused on those whose needs are not being met. Those of average means who would prefer not to trade quality. Those concerned with energy costs and the long-term durability of their investments. Those inspired by sustainable, indigenous materials and the endearing imperfections of work-done-by-hand. Could this House Change the World? Don’t let the pictures fool you. The activity taking place on this rolling, 40-acre spread on the rural edges of Columbus, Georgia, may look like any other house being built but looks can be deceiving. It’s actually a grand experiment. A great leap backwards to take us forward once again. This is the future site of the Adams House, a 3,000 square foot, structural masonry and timber frame home centered on a grand fireplace that, if everything plays out as planned (and hoped), will be completed for just under $80 a square foot. In return for that investment, its buyers will receive a rock-solid, practical, custom-built home whose shelf life can be measured in centuries. Clay Chapman is not an architect. He’s not even a homebuilder, really. At least not in the production-oriented way we consider those terms today. He’s more like an artifact from a simpler time — a “field architect,” so to speak. A craftsman who, in the practical application of his trade, was taught the basic patterns of timeless architecture which, in turn, have become the basis for his own designs. Designs that have proven rich in sweat, sense and soul. For the uninitiated, structural masonry is construction in which brick or stone walls bear the full weight of the building, as opposed to simply serving as a cosmetic veneer for a frame constructed by other means. Chapman lays bricks three brick deep, giving his walls 12 inches of regulating thermal mass. The rest of the building rests upon them. In time, his increasingly substantial stables gave way to custom homes for well-heeled exurbanites and deep-pocketed townies. The results, without doubt, have been works of purity and great beauty but there’s something else you need to know for this story to make sense. Chapman, you see, views every house he builds as a small contribution towards a greater good — a dream of reforming how we build — and there was one none-too-minor aspect of his work that challenged that goal: its cost. In short, building meticulously detailed homes for wealthy patrons might provide for a comfortable living but it wasn’t going to impact industry norms in any meaningful way. Yes, historically-speaking, buildings of the noble and well-born have always served to educate, inspire and drive innovation (and, for the artist, present wonderful opportunities), but what really distinguishes our historic building stock from today’s disposable landscape is the skill, durability and practical wisdom embedded in its everyday buildings of common men. I wonder, he thought, if the benefits of structural masonry construction — its permanence, beauty and gentle environmental footprint — could be made attainable, readily so, to the middle class. So he set out to do what tradesmen have always done: Try it and find out. That’s a promising start. And from there, his ambition to keep the house under $80 a foot — on par with that of everyday, conventional tract housing — drives other design choices. For example, masonry corners are labor intensive, which adds disproportionately to cost, so the Adams House is a classic, 4-sided box. That may sound like a concession, but it isn’t. Think in terms of homes historically. More often than not, they also started out as a box, then grew over time via smaller boxes added on. We may have become indoctrinated by the idea that over-articulation is necessary but it’s simply not the case. Scale, balance, and the manner in which a building’s variations catch light all contribute greatly to its dignity and presence. Then there’s the daylight basement. To build the ground level and second story as a 2,000 square foot house on a slab would have averaged out to roughly a hundred dollars a foot (or more) but by adding a basement, finished out, you gain 1,000 additional square feet of living space for only modest additional cost. Finally, there’s windows. Chapman loves them, and has included 50 in this one design. 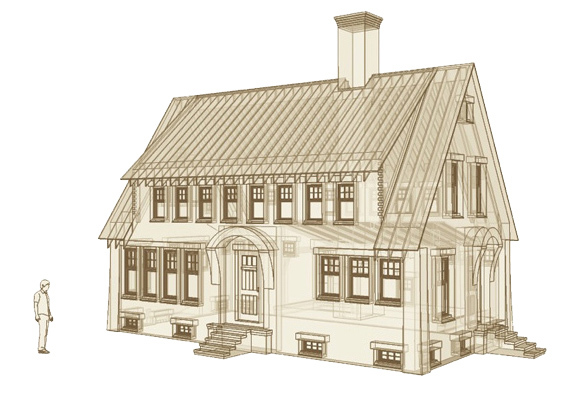 When cost is not the driving factor, he’d typically top each window, or bank of windows, with an arch to maintain the high design and structural integrity of the building. That might run $400 for a four foot span. To reduce cost, he might employ steel lintels instead which, to cover the three-brick thickness he builds with, would be about $100. In this case, however, he wondered what would happen if he employed slabs of finished granite (see photo above) for window headers. Turns out, they run about a buck an inch, or just under $50 for the four foot span. The end result? Functional elegance, more than 85% off. A creative cost savings that, taken with the others, allows for certain indulgences. For example, the Adams House will contain no drywall. 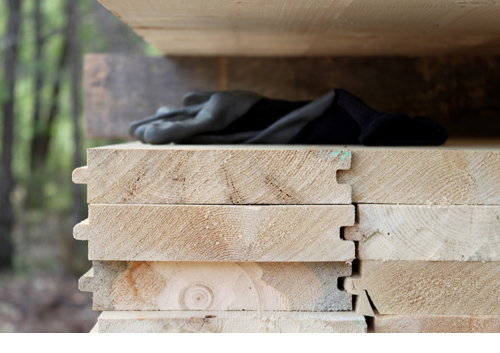 All interior partitions are being constructed of solid, tongue and groove planking. The Adams House project is full of stories like these. Here’s another. When I visited, Chapman was nearing completion of a small outbuilding about 100 yards from where the house will be. Why? Because, during construction, he likes to live on the job site and needs a place to sleep. He gets up each day, makes coffee over a campfire, and lays brick. 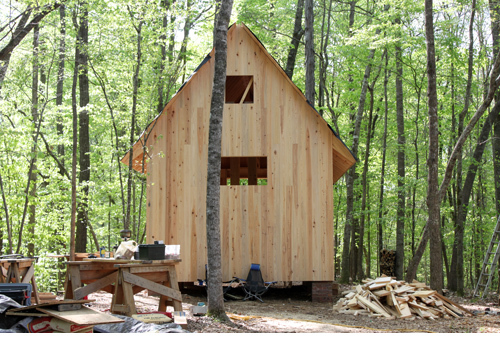 When the house is done, the cabin will become a studio, retreat or playhouse for the owners. This is the point at which you start to realize that Clay Chapman exists in some sort of alternate universe, doing things totally alien to how we now think of homebuilding. The things you see when you watch him work, or hear when you talk with him, seem impossible or, at the very least, impractical. And yet he’s doing it. As no shortage of people struggle with delivering solid, dignified housing for an affordable cost, he’s doing it. And then some. Providing a home of true permanence, capable of lasting for as long as it remains loved, at a price suited to the middle class. All of this raises an interesting point. For some time, we’ve been expecting housing innovation to somehow emerge from otherwise conventional circles and yet, in other aspects of business, we routinely assume that innovation will be driven not by the entrenched but by hungrier, more flexible, more creative outsiders. The challenges of affordability, durability, and beauty could be well served by such outsiders. And I think I’ve just stumbled upon one of them. 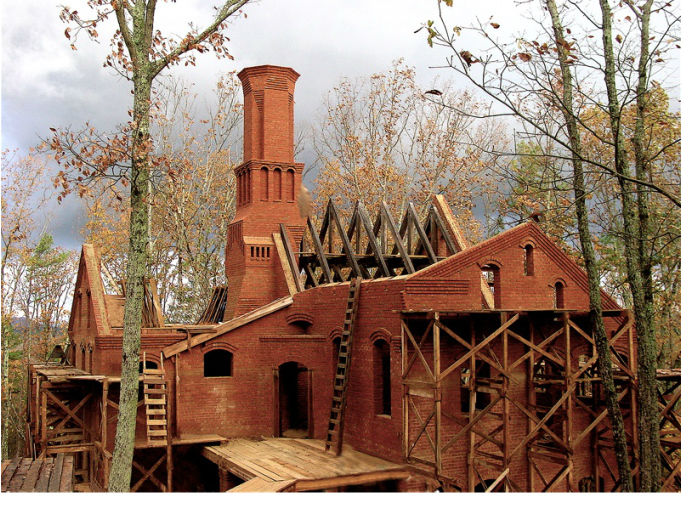 Last year, Clay met “Original Green” author Steve Mouzon who, like a number of others, has worked tirelessly in support of traditional building and has achieved small-scale affordability through his work with the Katrina Cottage movement. Mouzon recognized immediately that affordable permanence, equally implementable from the rolling, subsistence farm in the countryside to the tightly-knit, walkable city neighborhood, was the “holy grail” he’s long sought. His encouragement proved propulsive. In response, and despite his discomfort with self-promotion, Chapman has launched “Hope for Architecture,” a documentary and blog effort to chronicle his ongoing progress on the Adams House and make its lessons learned available to others. Visit him, check out his body of work, follow his efforts on Facebook, and share this blog post. His story is the tree falling in the forest. I think that the most truly cost-effective solution is a combination. It’s traditional, too. Look at old houses, and you’ll see a gradient from a solid–often brick–front block with major rooms to a back ell that’s a little less sturdily built. That often has sheds built on it, and then there are usually detached sheds (and historically outhouses) behind that. So you have a gradient, with the most permanent part the most solidly built, and the progressively more temporary/improvised parts behind it, and sometimes to the sides. This is a fantastic piece. That one insight alone — that “embracing masonry” — saves nine steps that would be otherwise needed in a wood frame/drywall system — alone was worth reading the piece. This topic desperately needs more attention. More, please. How do I get hold of this guy so he can build me a house? First, it’s not just as simple as making a design choice to use structural brick. There just aren’t people out there that either have the expertise or the will to do this work. Yeah, you find a guy to feature in your blog, but nice try getting anyone local to bid on your project. Second, $80/sf sounds great… but I’m sure you’re not including real estate costs, what else isn’t in that number? Besides all that, I would love to get a quote for an outbuilding but I’m sure local contractors first/last words will be ‘pole barn’. Hi, Jesse. Thanks for the comment. I hope I didn’t make it sound like it was easy to find someone doing this. Quite the contrary, actually. I totally agree that most people can’t just pick up the phone and have something comparable done for the price described. It’s how rare Clay’s story is, and how contrary it is to conventional practice, that makes it a story worth telling. My hope from doing so is simply to establish a reality-based contrast to the idea that no one can build like this anymore. Clearly they can. But whether or not there’ll ever be enough people out there willing to look at the world the way Clay does, and approach their vocation accordingly, remains to be seen. He may just remain a rare bird. We’ll just have to see. As for the house, it’s a turnkey deliverable, complete with fireplace and all systems and appliances. You’re correct that the $80/sq ft does not include land costs. Gotta draw the line somewhere. This guy could be the Joel Salatin of the building industry. Nice story. Thanks, Daniel. Now I’m mad that I didn’t come up with that hook myself. Forgive me if I steal it for a future post. Wonderful to see this house going up! And I’m very excited about the number… don’t remember discussing $80/SF when we talked a few months ago… that’s outstanding! Simply put, this is a very important project we should all keep our eyes on. Many reasons for that… far too many for a blog comment. Please keep us posted. I appreciate what you’re trying to do & will definitely be following the blog. I see the key to this project’s success as it being replicable. Not just by Clay, but by a general contractor or someone acting as their own, being able to hire a masonry company & get a similiar result. Interesting article – but not very definitive about just how he can achieve the low area cost, nor how he plans to meet the increasingly stringent code requirements (esp. energy related.) Seems more of a promotional rhetorical piece than substantive. The two points that are classically understood – reduction of configuration, and inclusion of basement usable space where you’d typically only have frost wall foundation – are valid and beyond reproach. Locating the hearth/heat-source away from outer walls is also not a new idea – more akin to the medieval hall with its fire pit and smoke hole thru roof, with the additional mass heat-sink and distribution within the shell instead of loss to the outdoors. The concepts are very old, esp. Northern European and brought to the US. It’s interesting to call 12 inches of brick “insulating” thermal mass. I remember that apartment I had on Bradley Avenue that was like a clay oven in the summer. I note that the photos show ample supply of shading elements (trees), and I would have appreciated that, or a good crop of climbing ivy. Anything to cut the unrelenting rays of the summer sun. Another phrase – “gentle environment footprint” – doesn’t always apply to some types of masonry. It used to be that clay masonry was fired on-site, like at Eureka College. That was then, this is now – where we expect a higher performance product in terms of porosity, uniformity in size and strength, and resistance to weather. I’m definitely in agreement about the number of products/processes/trades involved adding up the cost of construction of basic shelter. That’s why most schools we do have an exterior veneer, air space, closed cell insulation, and interior masonry load-bearing block with a coat of paint. Durable (inside and out), thermally efficient, and cost-effective. The problems with load-bearing and exposed structure arise with our need to have integrated and concealed systems for electrical and mechanical. Where we don’t have such issues and can expose the elec/mech, the cost is lowered by not having to have a suspended ceiling (but then there’s the acoustical advantage lost in larger rooms). A broader knowledge of indigenous construction over history would serve his needs. Where he’s coming from is very conservative except in time and effort. There’s a reason for grass and/or mud-brick huts, just as there’s a reason that in parts of the South and tropical climates the emphasis is shelter from sun and rain with enhanced ventilation. Using the local abundantly available materials, and responding to site, climate, and other issues (like need to complete the shelter before winter and allowing time for harvest), shape the most functional alternatives. No where is the concept of other than a single-family dwelling mentioned – obviously this is the mindset of someone who’s worked not in spec-projects but for the well-heeled. Even the Tumbleweed Home fellow doesn’t address that kind of site utilization. I’m not sure I’ve found anyone who did it better than the class row-house, which could accommodate multiple families for the footprint, while leaving valuable grade space for shared access from public street and private rear court. That type of building is best suited for the urban plan, where goods and services are purchased from others. Lar, I really appreciate your contributions here. Your level of knowledge on the subject is clear, so I can see how you would find a lack of substance, but keep in mind that we’re editorially geared towards a non-technical layperson audience. Rather than a summary report, my goal was more an introduction to Clay’s somewhat unconventional quest, with basic questions answered and a reference point established from which I could dig more into the “how’s” later, when he’s in the midst of tackling those particular issues. At an $80/ft price point, I expect some variety to occur. Some problems will be solved through traditional means, some through new or conventional means. Some will only be mitigated and others may simply prove to be required trade-offs. We’ll just have to see. Once he’s well into vertical construction, I expect to revisit. I hope you’ll hang around for the discussion. Thanks again. Thanks Lar! No discussion in the South would be complete without a tall-poppy-lopper. Beautiful work but “alternate universe” is the most accurate phrase in this story. Really a nice written and nice pictures. I didn’t believe first that a custom home can be build at $80 rate, but Great ideas found here for building a low cost custom home in a budget. Thanks for your blog. 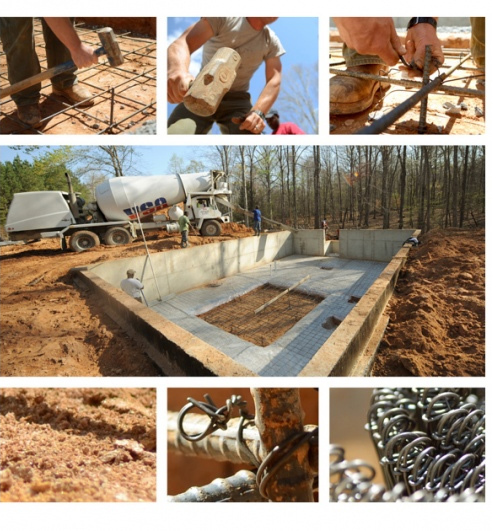 Building a structure is not an easy task it may require good foundation to create one. Mission goal: To pull community together by bridging the generational gaps. We provide summer camps for young men and women (not co-ed), to unplug from the mass media and bring them into nature. They work together, learn skills, discover talents and provide services for senior citizens. The boys have built a chapel and two cabins. It was a huge and proud accomplishment that also taught them carpentry skills. We have had the grace of having awesome master carpenters volunteer to participate in this endeavor. We are on our second round of seeing 24 boys through their teen years, and have received a small grant to start another building. Would love to speak with someone who could give me some advice. Our dear archetect and lead carpenter has passed away. Thank you in advance for any information you can contribute. We are located in Conyers, Georgia. Thanks for providing the wonderful information aboutNew Home Builders in Alabamaand it has been fastest growing homes in Alabama.